As an offensive player with the basketball, you want to have an attack mindset and operate in straight lines, not loops and arcs. Too often, players allow defensive contact to force their penetration off their line of attack. This happens because the skill is not consolidated by athletes. Basketball players aren’t used to constant contact, nor having to play through the contact an entire game. As coaches, we need to progressively introduce contact more often in our practices. 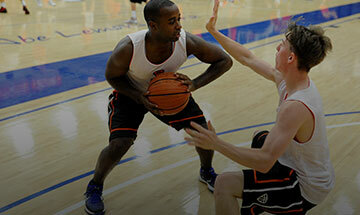 As athletes, we need to acquire the skill and become comfortable playing against contact. I find this especially true with female athletes. Think of a football team. Good football teams have contact involved in most drills – even if it’s light contact. (My younger brother is a highly skilled high school junior who plays wide receiver and has a chance at Division I football, so I’ve been to quite a few football workouts). Football players love contact. They invite the contact. They welcome the contact. As a result, any good receiver knows to make catches in the open field, he’s got to hit the defender first. The same can be applied to the game of basketball. I avoided contact throughout most of my career. Yet after attending PGC the first time, I continued to hear this repeated phrase in my sleep: A bump on the hip or a slap on the wrist shouldn’t deter you from making a strong, powerful move to the basket. I wanted to become that strong, powerful player, and I realized the area in my game that needed improvement was around inviting contact. I encourage both athletes and coaches to consider this thought and implement more training against contact in your drills and practices. Just like in any good fight, the first punch is critical. As an offensive player, you’ve got to initiate the contact with the defender or you’re in for a knockout.